Data is the lifeblood of all online businesses today. But data is only valuable if it can be accessed and analyzed by those who need it most. For Kajabi and their customers, data is critical to understanding their users, the performance of their digital content, and the trajectory of their business. Founded in 2009, Kajabi makes it easy for anyone to establish an online training business. The platform provides tools to create and manage and sell course content, launch marketing campaigns, and build a website. Kajabi has been used to power a wide range of online courses, from best-selling authors, motivational speakers, and fitness gurus to everyday users who want to make a little extra cash sharing their expertise. When Kajabi’s two founders started the company, they wanted to get their business up and running as quickly as possible. They considered building their platform on AWS, but the lean team didn’t want to be slowed down by infrastructure concerns and the hassle of setting up and maintaining servers. So, they turned to Heroku’s platform-as-a-service (PaaS) model, which provided a fast, developer-friendly path to deploying apps. Thanks to Heroku’s managed platform, Kajabi’s engineering team has not had to worry too much about DevOps from day one. Instead, they’ve been able to focus their valuable time and energy on developing their product. As they built out their architecture, the Kajabi team decided to use Heroku Postgres as their relational data store. They had considered using RDS but preferred the convenience of a managed data service that saved the team time and headache. The team relies on the additional features of Heroku Postgres, such as forks, followers, and PGBouncer, to help them manage and scale their database. By far, the most valuable feature of Heroku Postgres has been Dataclips, which allows the results of SQL queries to be easily shared. When the Kajabi team began using Dataclips, they needed an easy way to generate reports on their data in Heroku Postgres. Marketers and business teams would request various reports from engineering almost daily. With each request, they would have to build code into the app, and then deploy it before they could pull a one-off report.This process was frustratingly time-consuming and added extra overhead and delay for everyone involved. In addition, data became stale quickly, resulting in more frequent requests. With Dataclips, generating a real-time report is astonishingly easy. The Kajabi engineers can run an SQL query from within the Dataclips dashboard and instantly pull a report that exposes live production data in a read-only format. No app code changes needed. They can then share the Dataclip using a secure, unique URL with anyone inside or outside the company. Marketing and business teams can use the Dataclip to easily view daily updates on platform usage, and engineers can better track and manage the health of their database and apps. CEO Kenny Reuter even runs his own queries to help him analyze business metrics, and the team hopes to train other business users to build their own Dataclips. In addition to employees, Kajabi customers also need real-time data to help them track their success on the platform. Customers use Dataclips to gain valuable insight into the performance of their training course content, so they can improve their offering, provide better customer service, and strengthen relationships. 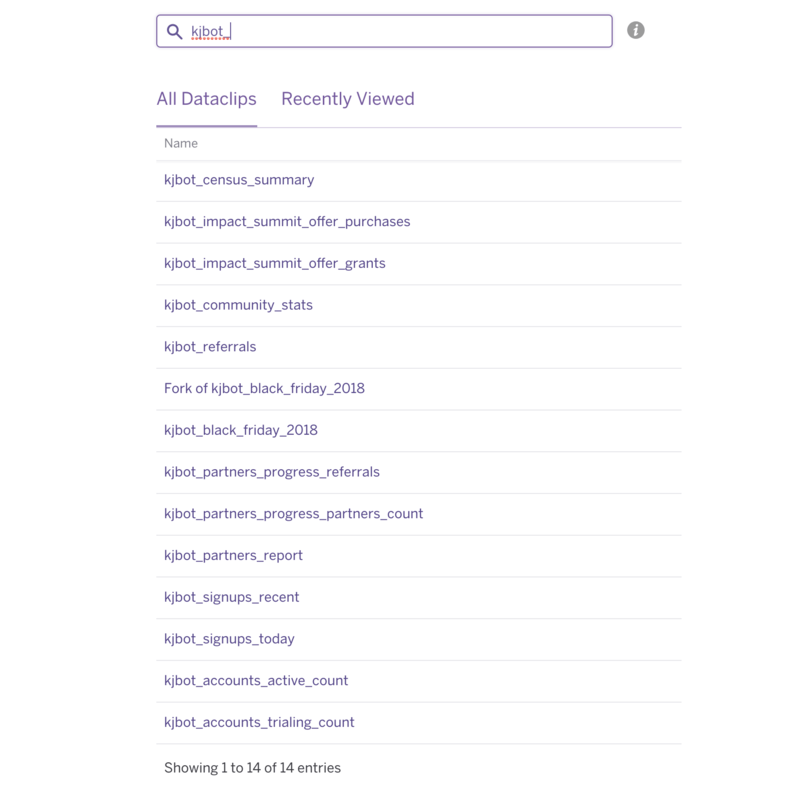 Sometimes, Kajabi’s top customers will request a special report that surfaces data in a way that’s unique to their business. Kajabi engineers can easily pull and share a one-off Dataclip with the customer, empowering them with the right data to help inform their business processes. One creative way that Kajabi uses Dataclips has been as an API. Recently, the team had built a chatbot and wanted to integrate community stats from Heroku Postgres. They didn’t want to go to the trouble to write APIs into such a small app. Instead, they built a number of read-only Dataclips and used the JSON-formatted request to feed Postgres data into the chatbot. It took all of 10 minutes late one night prior to launch, which gave the team an “aha” moment that spoke to the ease of using Heroku. As the chatbot evolved, the team added more data to it and anyone in the company can query it for data. The first time it became truly exciting was during a Black Friday promotion, and the marketing team was able to get immediate insight into the performance of the campaign that they’d worked so hard on. As a result, the marketing team was way more enthusiastic than they would otherwise have been. Since Kajabi integrated Dataclips into many different workflows, teams across the company have been able to gain insight into their data faster, and ultimately make better decisions for the business. Does your business need to easily access and share live app data? Kajabi uses Dataclips to share data from Heroku Postgres running on production with internal stakeholders and customers. For more information, contact Heroku today. Kajabi is an all-in-one platform designed to enable anyone to build and run an online information business. The platform helps users create online courses, launch marketing campaigns, build landing pages, and design their website. Kajabi has been used to power popular online training from New York Times best-selling authors, motivational speakers, celebrity fitness trainers, and diet experts, to NFL and NBA players. Everyday users also use Kajabi to make extra cash selling content based on their own talents. Kajabi is based in Irvine, CA. For more information, visit kajabi.com.